Upon starting the second rappel from the summit of The Tooth, a Basic student hit his knee on the rock. 90 minutes later, the student states, "I'm going to pass out." Upon starting the second rappel from the summit of The Tooth, a Basic student hit his knee on the rock. He said it was fine, and after a minute to recompose himself, nothing more was discussed until after our final rappel to the rock field below the base of the climb. At that time, about 90 minutes later, he discovered that his knee had swollen significantly although he said the pain was minimal. As the medical lead for the trip assessed his knee for stability, the Basic student then stated "I'm going to pass out, I can't look at it, this happens all the time." We leaned him back with his feet elevated before he lost consciousness. He was unconscious for 5-10 seconds. When he awoke, he was minimally disoriented, not unexpected when waking up in a boulder field. At this time we had a lengthy group evaluation with the Basic student where he stated that he had a lifelong history of passing out when seeing his own injuries. Knowing this and believing it to be accurate after discussing and eliminating other possible causes of fainting, we let him rest a few minutes while giving food, electrolytes and water as a precaution for any other potential causes of his fainting. He also self-administered Ibuprofen for swelling. At that point, we started moving at a slow pace to make sure he was okay. Based on how he did, we would have to elevate the medical response immediately as it was now after 3pm. As he walked out under his own power, it became clear that he was not having any further issues, and we made it to the trail head without further incident. Throughout the Post Climb Discussion in the parking lot and dinner in North Bend, he showed no further signs of the episode. He was advised to seek medical attention for his knee the following morning. 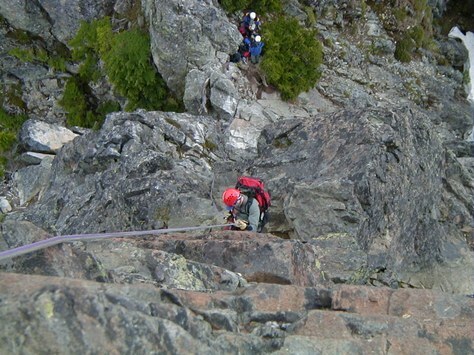 We were lucky that this episode occurred after we had safely finished our rappels, and this is a great reason to encourage climbers to use safety mechanisms like an auto block while rappelling. A relatively minor injury can lead to severe consequences, especially on technical climbs. Would it have been prudent for the student to disclose the potential for fainting before the climb? To my mind that is a risk factor the party may have wanted to know about about ahead of time.